Why you choose stone engraving router machine from our company? When we choose the marble stone engraving machine, it is also important for us to choose a good cnc stone engraving machine manufacturer. Jinan Dekcel Cnc Equipment Company has focused on stone engraving router machine more than ten years. Why you choose us? What are the advantages of ours stone engraving cnc machine? 1. Stability of the bed structure: the heavy duty stone engraving machine adopts gantry design, and the bed is designed with double beams, which ensure the stability of stone cnc router when processing. 2. Constant power spindle: when the spindle is running at high speed, it can ensure that output torque capacity is constant. 3. Unique filter water tank and water circulation system effectively prolong the service life of the tank. 4. Automatic oil injection system to make the maintenance more convenient. 5. Three shaft all dust proof and waterproof design. 6. The humanized design, the machine is equipped with work light to make the work conveniently in the night. 7. It has the function of intermittent carving, power cut recovery, processing time prediction and so on. 8. All the units of our cnc stone engraving machine are assembled with precision parts. 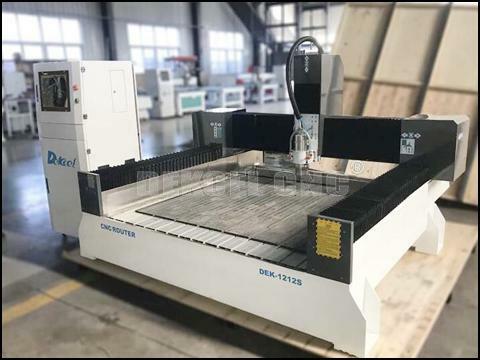 Therefor, if you are interested in our cnc stone engraving machine, or have any question about the cnc router for stone engraving. Please contact Jinan Dekcel Cnc Equipment Company, we are support service 24 hours online.